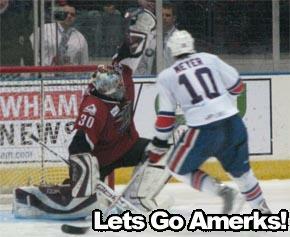 Amerks Lose in Shootout After Being Ahead 3-0 · Let's Go Amerks! The Amerks led 3-0 after the end of the first period, but fell asleep during the second and allowed the Lake Erie Monsters to score three goals to tie the game and lead to a shootout.Â Jamie Lundmark of the Monsters scored the only goal in the shootout to give the Monsters the win. Stefan Meyer scored the first two goals of the game within a span of 2 mins and 19 seconds, they were his 15th and 16th goals of the season.Â He had a chance in the second to get the hat trick but the pass from Dylan Hunter took a bad bounce off of his stick. Patrick Kaleta made his presence back in Rochester known as he was throwing hits all over the ice all game.Â It was great to see that even after a long stint in the NHL he’s still willing to put in a great effort for the Amerks.Â The same can’t be said for many players when they get sent down. The biggest problem the Amerks have had all season is managing to play a full 60 minutes of hockey.Â That was the issue yet again tonight as they had what should have beenÂ a comfortable three goal lead, but managed to let that completely slip away in the second. In the third period as a shot trickled past Tyler Plante and was headed across the goal line Marc-Andre Gragnani made a great play to swipe the puck away from the net just in time.Â If not for that play the Monsters probably would have won in regulation. Mike Funk was injured in the second period and chose to sit out the third.Â He said he won’t be playing on Saturday night.Â Hopefully whatever he hurt will be healed by next Friday.Â Funk had an assist on Meyers second goal of the game. The team put together a great effort in the third but was unable to put any shots into the net.Â Overall it was an even game, which can probably be expected from two teams at the bottom of the league.Â The Monsters had 30 shots to the Amerks 28.Â The Monsters were 1/6 on the power play while the Amerks were 0/3, which included a power play in overtime. One nice thing to see at the game was a crowd that didn’t seem to care that the team is now in the midst of a seven game losing streak and has lost 23 of the last 25 games.Â Typically you only see the wave go around an arena for a team that’s playing its best hockey and winning, so in a way it was great to see tonight.Â Also thumbs up to the two guys with the horns who kept ‘Lets Go Amerks’ chants going.Â This was a big change from the small crowd and boo’s on Wednesday night.Â Only one person was spotted with a bag on his head tonight. Marc-Andre Gragnani, Stefan Meyer, Anthony Stewart, Mark Mancari and David Brine all had chances in the shootout but none of them managed to put the puck past Monsters goalie Tyler Weiman. Franklin MacDonald, Adam Taylor, and Marek Zagrapan were all scratched from the lineup.Â Marek has been sick, and with the return of players from the Sabres and Panthers it meant that the team had to actually scratch players from the lineup. The Amerks and Monsters play again on Saturday in Cleveland, game time is at 7:35.Â As always you can tune in to Hot Talk 1280 or watch live on B2 Networks.